Gina Rinehart is killing satire | what prevents you from dancing? I’ve noticed in the last 24 hours a whole lot of my friends sharing this post about Gina Reinhart calling for the sterilization of the poor. Some of us immediately spotted the joke, though I’m not sure we were laughing very loudly. Many others, all intelligent and progressive, took her comments at face value and read the article as a straight piece of journalism. And so they expressed their outrage, tweeting and posting in disgust things like “There are some people so poor, the only thing they have is money” and lamenting the fact that it was now too late to sterilize her parents. Why have so many of us been fooled? It would be unkind and incorrect to say they were naive. Such an explanation would ignore that as outrageous and out of step with public opinion such rantings from the über-rich may be, this satirical piece is only a mere inch away from what this special class of billionaires really think. Or at least what they think they can get away with saying in the public sphere (someone forgot to send the memo on that to Eddie Maguire). In fact, when one compares what Gina said in the satirical piece to some of the helpful advice she has actually given us of late, one finds there is frighteningly little difference. Earlier this month, the heiress to a mining fortune was telling it like it is: reminding the proletariat and the government that we cannot continue to abuse the mining industry and expect them to just benevolently keep on giving. So why and how does Gina (and others like her) get away with saying such outrageous things? One explanation, I think, is as ludicrous as this may immediately be to most of us (and as much as it might offend what has developed as our shared sense of ‘decency’ and how we would like to treat each other and be treated) such views fit perfectly with the dominant logic of our time: the logic of the free market. It accords with Gina’s beliefs and her wisdom as a superior entrepreneur (though how exactly someone could stuff up being handed a license to our commonly owned resources so that she can dig up coal and iron ore and sell it is yet to be explained to me). The belief that we must leave it to the market to determine all matters in life. A free market (or at least one instigated by a strong and punitive state) together with unfettered capital will determine outcomes that for most of us are adverse and not too far from what is described in the piece on the Daily Current that shocked so many of us – entrenching further inequality and leaving many of us on wages we cannot live on and competing for access to privatised services that don’t really deliver what we need. There is a second major consequence of the rantings of Gina and her ilk that is missed when we mistake satire for real life. Or when we simply respond with a cacophony of outrage. It serves to normalise and make acceptable another set of arguably more dangerous ideas – ideas that sit closer to the window inside which we find those ideas and policies deemed acceptable or rational. That is, ideas that are more likely to be adopted. A recent example of this can be found in the 75 policies published by the IPA and that they are calling on Abbott to implement when he comes to government. The IPA know not to suggest that workers toil for the kind of wages Gina so boldly or stupidly calls for. They do, however, call for slashing senior public servants’ pay; ending local content requirements for Australian television stations and deregulating the parallel importation of books – all policies that would in the long term adversely affect local industries and drive down wages for most of us. And while we might now roll our eyes when we hear yet another IPA staffer question climate science, they call for the privatisation of the CSIRO and abolishing the Department of Climate Change – the very bodies who might be able to conduct and formulate policies based on the already firmly established science in the public interest. So, while we need to prepare ourselves for the rough and tumble world where the line between reality ends and satire begins is well and truly blurred, we might do well to save some of our outrage and our energy for fighting the ideas that then end up seeming less outrageous. And importantly for formulating some alternatives to take their place. Let’s start posting and tweeting about that. I admit the Daily Currant article had me going for a while, given that her dad believed in things such as sterilization for Aboriginal people and using atom bombs to build harbours up north. Perahps the ‘weirdest’ (or not) thing is that all the big plans of these free-market billionaires end up needing massive interventions of the state to carry them out. Hi Tim – that’s exactlty why I wrote the piece. Many of us were taken in because it so closely resembled what she and her father have indeed said in the past – a sad indightment about what passes for public debate when renegade entrepreneurs are accorded a disproportionate space within our debates. We should for the most part ignore them and start different conversations we want to have. Their comments serve to drag the window over to a very extreme position – as evidenced even by the satirical piece. I mean just look at how many of us were then defending our ovaries and our right to reproductive freedom from the likely control of a billionaire heiress who has other plans for us poor. Aside from wasting our energy, becoming entangled in inane non-debates poses other dangers for us. We concede the space of what is reasonable to ‘less offensive’ parts of the Right. My final point is that we should fight the conventional wisdom that is found much closer or at what is now the centre, not the outliers. And most importantly we need pose alternatives – big ideas and visions for our future in the face of how stuffed up and stuck things may seem right now. This is something I think many of us in our understandable despair have forgotten how to do. Re: your point about the State, that is exactly right. Neoliberals don’t all agree but to think they really support a strong state is to accept their populist version – the one that plays well for the masses, tapping into their discontent with the political class. To keep installing more markets, something many of us do not like especially when we encounter it with essential public services, requires a strong state to keep the people in line. 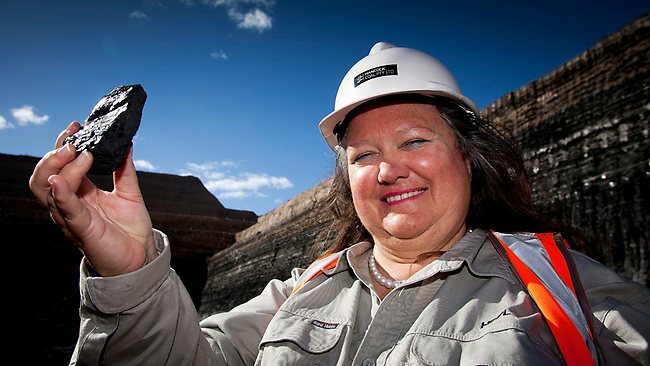 Though I think Rinehart herself is a pretty straight up free-market fundamentalist – no state or public domain, just coal and ore mines that she controls and where we gratefully work. Even further along the spectrum than her IPA buddies. ‘Battle ye not Ginas lest ye become like Gina’. I’ve tried to stop circulating Gina Rinehart memes precisely because a lot of them were becoming rather unsavory personal attacks. You are correct that the ‘nice neoliberals’ from consultancy firms & employer groups are pushing policies as obnoxious as anything Rinehart comes up with. But they are the reasonable ones of course so they are politely listened to on Lateline.